Alds. Harry Osterman and Joe Moore, as well as State Sen. Heather Steans and State Rep. Kelly Cassidy, are sponsoring a school supply drive to help elementary school and high school students whose parents don't have the resources to send them to school fully equipped for the new year. The deadline is August 10th, and there are several Uptown drop-off points. To sign up to sponsor a student, click here. To see what supplies are needed, click here. 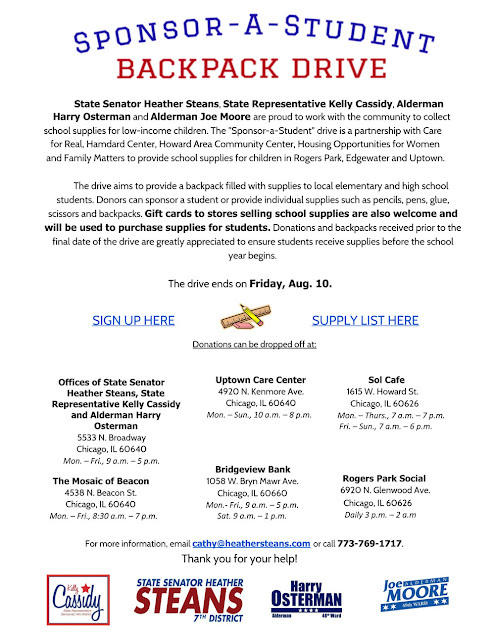 The Friends of the 46th Ward Schools will be sponsoring a school supply drive for students at Brenneman, Courtenay, Disney, Greeley, McCutcheon, and Uplift beginning in mid-August.